The D-day came much too quicker than I expected! 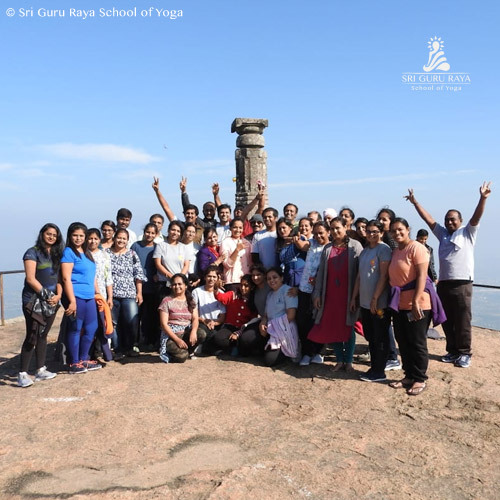 November 10th, 2018 was indeed a big day for the Sri Guru Raya School of Yoga (SGRSY) as our beloved teacher Mr. Veeresh had planned an outdoor trekking trip for his students. The chosen spot was the much famed Shivagange mountain peak which stands proudly at 2640 feet and is located near Dobbaspet, 54 kilometers from Bengaluru. We (Sudhir and I) were familiar with Sir’s disciplined and professional approach to many aspects of life and thus were not surprised by 4.45AM start time for the early morning trek. After a much-hurried visit to MK Ahmed, our supply bags were refilled to the brim and we hastily prepared ourselves for the next day’s trip. At sharp 5 am, our cheerful gang of 5 were flagged off for the 50-minute drive to Shivagange. The much-awaited ascent began at 6.30 am after the entire batch of 50 people of all ages had assembled at the entrance gates of the Lord Gavi Gangadhareshwara temple. The presence of the temple monkeys, stray dogs and the birds added a nostalgic old world charm to the jovial congregation. Our group was most definitely an odd mixture of 3-year-old children to sixty-year-old women, alongside with pretty damsels and perfect gentlemen. The binding factor was obviously “SGRSY”. There exists a warm, genial camaraderie among the members which is hard to describe and is best felt. The climb took almost two hours. The enthusiastic folks did have the head start and quickly made progress. They were the determined lots, which meant braving the spine-chilling cold breeze and the steep steps with their eyes firmly set on the peak. The selfie group, however, were clearly having all the fun. They were soaking in all the greenery, the crisp mountain air amidst peals of laughter and childish joyousness. Being in synchrony with nature probably brings out the best in us. The elders of the group were in no way out of the contest. They wistfully reminisced their childhood days and had a good many stories to share with us. We did make a few pit stops every now and then, just to sip in some water or to rest our weary legs or to help our co trekkers or merely to look at the beauty around the place. The Auburn tint of the sky with the mist rolling in gave an ethereal appeal to the mountain range. The view of the landscape below is amazingly beautiful with green meadows interspersed with blue lakes and the brown of the earth. It is, after all, the Lord’s own canvas and as mortal beings we can only gape with wonder at the beauty! 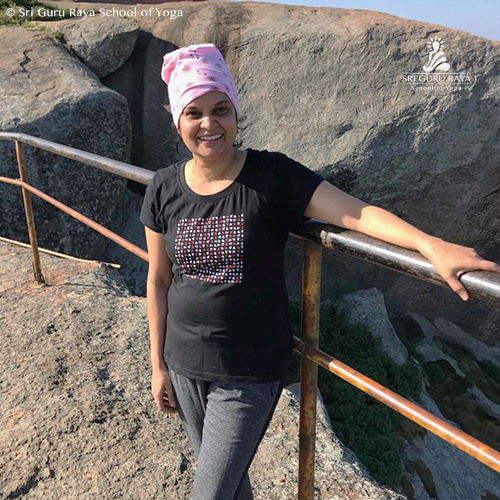 The trekking trail is dotted with many Gopuras, mantaps and small temples, perhaps to just remind us to take a break from the arduous trek and pay obeisance to the Lord above for our existence. As we hiked upwards, the trail became steeper and called for more caution and patience. This definitely was no race, one just needs to trust oneself and the Shiva Nandi duo who are watching us from the mountain peak. The ascent was ably guided by Veeresh Sir and a few of his close confidantes. Like a true teacher, he gently coaxed and lulled us into believing the Shivagange ascent is a child’s play. With his calm and reassuring words, he made sure that everybody was at ease and the trek seemed less strenuous. The entire group had finally assembled at the peak by 8.30 AM. The cheerful yahoos and jubilant shrieks rented the air with a happy note. The view from the top was breathtaking and made the trek treasurable. 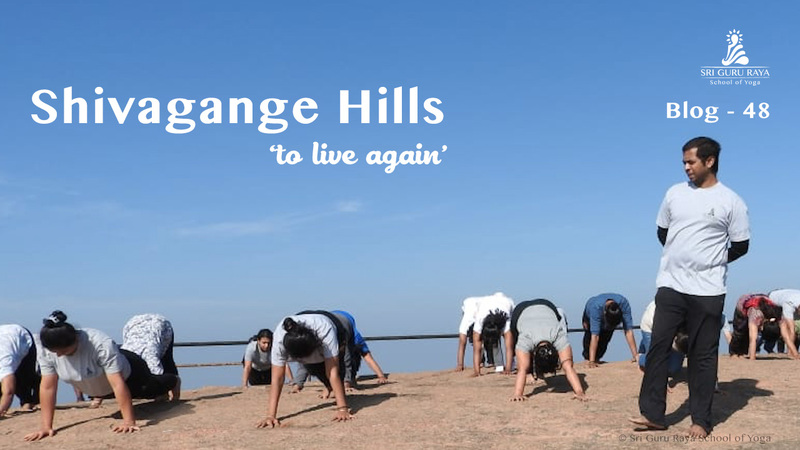 We spent almost an hour at the top and did a dozen Suryanamaskaras on the rough terrain. 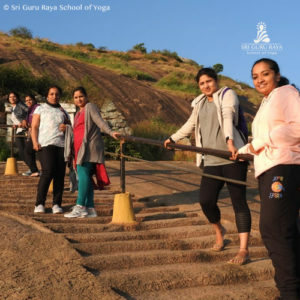 A few passionate yoga students displayed their skills at 2640 feet above the ground level and one could only incredulously stare at their amazing fitness levels and mental strength. My better half- Sudhir promptly ensured the food and water in our bags were devoured by all and made sure nobody was left hungry. The “always happy” cloak he constantly wears seemed a shade merrier on the mountaintop. After a contented hour, we started our descent which was quicker and less treacherous than the climb. But never the same, one small mistake or a slip, a person can go directly down the gorge. The mountains need to be respected at all times- climbing and descending. By 10.30 AM our entire group had descended and we left for a hearty breakfast, Uppuma and Kesaribath was heavenly and was eagerly gorged by all of us! It was soon time to bid farewell to our fellow trekkers and get back to the humdrum of our daily lives. For me, this pleasant hike amidst the bountiful rugged nature was all about quiet self-introspection, a challenge to my physical and mental faculties, a coupon to meet and interact with people from different walks of life and the best of all to walk hand in hand with my soulmate… couldn’t feel more alive!